After a long day of racing, Internet troll @nascarcasm joins me to break down all things Indy 500 and Coke 600. We discuss the love for Fernando Alonso, Scott Dixon’s scary wreck, Austin Dillon’s first win and grilled onions. Plus, @nascarcasm’s musical debut. The applause broke out almost immediately after Scott Dixon and Jay Howard’s cars slid to a stop, even before broadcasters were able to tell viewers both drivers were OK. Fans in the stands at Indianapolis Motor Speedway saw Dixon moving inside his destroyed race car and realized that — despite contact with Howard, an unscheduled flight for Dixon and a bad-angle landing that could have killed him — the “Iceman” was alive. And not only alive, but well. Of course he was, right? He’s Scott Dixon, the man who can go to the local Taco Bell, get robbed with a gun to his head and basically shrug it off. Dixon emerged virtually uninjured, save for a bum ankle that he said “was a little beaten up.” Even it’s broken, that would still be a near-miracle outcome from a crash that was one of the most frightening wrecks in years. One reporter asked Dixon if he’d ever been in a scarier wreck than that one. His response: Meh. “They’re kind of all similar,” he replied. “You’re just riding along and waiting for the big impact. And there were a couple (of big impacts) in that one. So probably more than normal. Not everyone was as cool about it as Dixon. Friends Dario Franchitti — whose career was ended by an airborne crash — and Sebastien Bourdais — on crutches after breaking his hip last week in a wreck here — quickly arrived at the infield medical center as reporters waited outside. Dixon’s wife, Emma, was on the scene as well — and even spoke to the media about her emotions. Emma had gone back to the couple’s motorhome to use the bathroom and flipped on the TV right at the moment of the crash. She told reporters everything was “moving really slowly in that moment for me,” but was massively relieved to see the safety team’s rapid response and the good news for her husband shortly thereafter. It’s been an eventful week for the couple — from Dixon’s pole position to the Taco Bell robbery to this. Meanwhile, her husband made his way down the long line of waiting media. Dixon calmly relayed what happened in the crash and seemed just fine with repeating himself again and again, continually popping a smile. And why not? 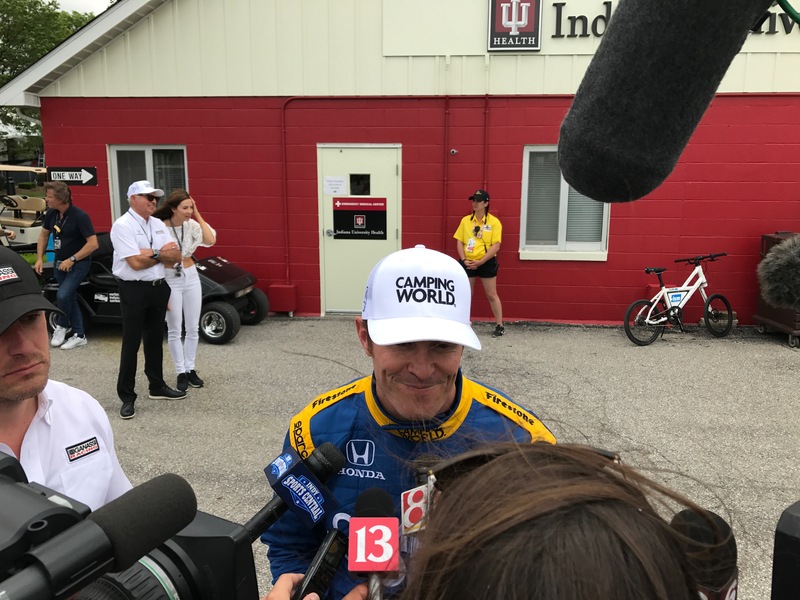 Dixon may not have won the Indy 500 on Sunday, but he walked away with breath still in his body. After his horrifying crash, that seems like a victory in itself.